There is something magic about this name: 'MARCO POLO, VENEZIA'. On this occasion, the fog made the arrival somewhat hazy. But knowing Venice was down there and tracing the line of the rail and road bridge into Venice...that really was special. "I look down on it again myself: Venice, mysteriously interrogatory and enchanted, tranquil and troubled. Pathetic, motionless, delicate - sailing, maybe...There is a moment of silence in the airplane, our fraction of eternity. Japanese, Brazilians, Venetians...who are we, really, in here, but a group of individuals, big and little, young and old, spying on the flower of stone in the sea from on high?". Every time I arrive in Venice, I'm armed with a list of things I want to see, do, experience. I've never yet gotten through that list. And I always add more. Venice is a life long project, I think! 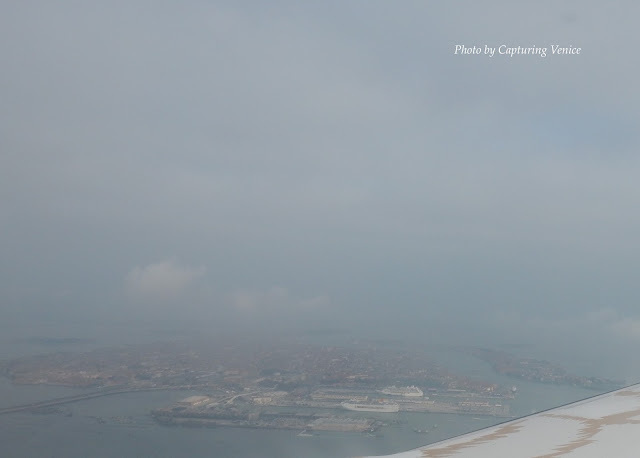 Thank you for stopping by, and thank you for sharing your experience in Venice.